Everyone’s skin is unique, but there are five basic skin types. Knowing which type you have will help you take care of your skin and choose skin care products that will keep your skin looking healthy. Keep in mind that your skin may change as you get older. Other factors can also affect your skin type, such as your lifestyle, diet or hormones. Keep reading to find out more about the five basic skin types and learn how to figure out yours. Normal Skin Type. With no dry or greasy spots, this skin type causes the fewest problems. If you have normal skin, you will notice that your skin has a good amount of moisture without too much oil production, giving you a healthy—clean and clear—complexion. Dry Skin Type. If you have this skin type, your skin will be dry and flaky, either all over or just in patches. Dry skin also feels tight and has finer lines and pores. It can even be prone to skin irritation. Oily Skin Type. Oily skin tends to be shiny and greasy, again either all over or just in certain areas. Your pores will probably be enlarged and you are more likely to develop pimples, blemishes or blackheads. Combination Skin Type. As the name implies, people with combination skin have two different skin types. These can occur anywhere, but it’s more common for oily skin to occur in the T-zone—the forehead, nose and chin—while the cheeks will be dry. Pimples and blackheads will show up on the oily part of your face. Sensitive Skin Type. If you have this type, your skin may feel very itchy and tight. You will also be more likely to develop dryness, redness or irritation. Of all the skin types, this one is the most delicate. Wash your face using a gentle or mild facial cleanser. This will take off any make-up, dirt or oil. Pat your face dry with a clean towel. Don’t rub, because this can irritate the skin. Wait for 30 to 60 minutes. Try not to touch your face during this time. Take a look at your face in the mirror. Use the skin type guide to decide which type you have. If you are still unsure, ask your skin care professional. Bathe no more than once per day, and avoid long baths or showers. Stick with gentle soaps and avoid deodorant soaps. Don’t scrub your skin while bathing or showering. 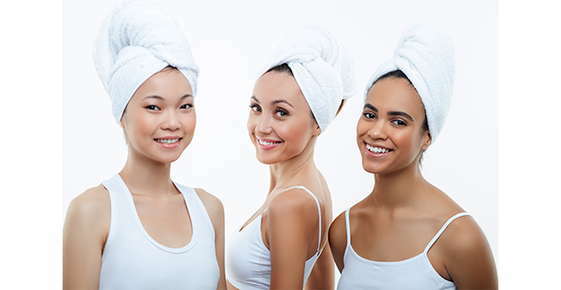 Pat your skin dry with a towel, instead of rubbing it. Use a rich moisturizing ointment or cream soon after bathing. If your skin gets dry later, reapply. If your house or workplace is dry, use a humidifier. Wash your skin no more than two times a day, although you can wash anytime after you sweat a lot. Use gentle soaps and cleansers, and avoid scrubbing your skin. For faster healing, don’t pop, pick or squeeze your pimples. Follow the skin care instructions the dry skin type. You may need to experiment with soaps, cleansers and skin care products to find out which ones irritate your skin. To bring out your best skin, and to find the perfect products for your skin type, talk to your skin care professional.